By	Chris Celnar. Last edited by Marios Alexandrou on December 17, 2018. Once chinchillas get used to their environment, there will be few instances where you actually must pick them up. Our chinchillas are very good about going into their cage with little prompting. If you can maintain a consistent schedule, you'll find that the chinchillas will go where you want them to without any prompting at all. For us, this means that around our bedtime the chinchillas will run in to their cage and await their nightly treat (e.g. a raisin). However, it's hard to resist the temptation of picking up your chins. If for no other reason than to feel their incredibly soft fur. So if you're going to pick up your chinchilla, you might as well do it the right way. That is, scoop them up from below and always support their back legs. We also like to keep them close to our bodies so that they're less likely to jump. What you want to make sure you don't do is pick them up by the tail, squeeze their bodies too much, grab them by their ears, grab them by the neck (like a cat), or bring your hands down on them from above. All of these actions will agitate your chinchilla and can lead to harm. We've also noticed that they have good memories of stressful situations and it requires a day or two for them to trust you once again. Our chinchillas also like to have their heads rubbed in between their ears. They also sometimes tolerate gentle chin and belly rubs. I've cared for many kinds of pets, I am also a kidney transplant recipient. I mention this because a common item keep popping up that causes kidney failure in every pet prior to my caring for this chinchilla. You mentioned the same item in your main post , raisins. Raisins of course are dried grapes and though healthy snacks for humans, grapes in any form cause kidney failure in Dogs, cats, sugar gliders, and many other pets. Kidney failure is a slow killer and difficult to spot the uremic symptoms of those suffering, especially in pets. The final stages are too late to stop. Some symptoms are lack of appetite, vomiting coffee grind like substance, always tired, confusion, etc. I am concerned about raisins and the possibility of the same kidney failure in other animals possibly affecting the Chinchilla I am now caring for and hoping to make a permanent adoption of. We get along wonderfully and I'd like it to be a long time. My next door neighbor has a chinchilla and I use any excuse to visit and handle it as they are unbelievably soft and smooth. He tends to stay very still when I handle him, even when I'm putting him back in his cage. Is this just a nervous thing? Is it normal and will he warm up to me over time and walk around on my lap? HELP!! so my mom got a chinchilla from a lady and they thought she was pregnant but we're not sure. So how can you tell? Also she doesn't mind being pet on the head, chin, or her ears. However if you try to touch her tummy she runs away. You have to be quick to pick her up and then she doesn't have an issues with being held, but we aren't sure why she runs away when her tummy is touched and we want to know how to tell if shes pregnant. thanks! I have had my chinny Cheeko for a little over a month. He gets real excited for treats and always jumps everywhere and on me when he is out of the cage. He seems like he trusts me and good bit, but sometimes when I pet him softly he makes a tiny squeakish noise and turns his head turns my hand. I cant tell if its good or bad. Any Ideas? If he's not actively pushing your hand away, then he likes it. My guys both will climb into my hand when I put it in front of them. If they don't feel like it, they will push my hand away, but they rarely do because there are always treats after play time. Chinchillas don't like being picked-up...point blank! If for some reason yours does like being picked-up then consider your chinchilla to be a one in a million pick, and yourself to be pretty damn lucky. i just got my chinchilla five days ago and i absoultly love him i dont know alot about what they should have and shouldnt have. I try to catch him to put him in his ball so he can run around but he wont let me catch him and i cant just let him out of his cage because my parents wont allow it. If im sitting on my bed he just stares at me and i feel bad because he is stuck n his cage. so i was jus wondering if anyone can give me pointers on how to get my chinchilla to be comfortable with me and our surrondings and how i should care for him, also i have two brothers and they make random noises. Chasing and catching a chinchilla can really stress them out so try not to do that. Also, plastic balls are not really safe for Chin's because they get too hot and it often scares them. I have found with my daughter's Chinchilla that it just takes a lot of patience to be a good owner. Our Chinchilla (chi chi) likes to be petted on his head and loves to be petted under his chin and on his belly. Take time to sit by his cage and talk quietly to him. Offer him occasional treats like raisins, dandelion leaves, flowers and roots, and Chi Chi loves an occasional bite of fresh banana. Read as much as you can about Chinchilla care on the internet or get some books to study, they are complicated. If you spend a lot of time with him, and he gets used to being petted, you won't feel so badly about him being in his cage. It is really not very safe to let them out unless you have a completely chinchilla-proofed room. We let our Chin run in the bathroom once (took EVERYTHING out) and he still managed to cut his foot, probably on the ac/heat vent. Give him the cardboard rolls from used toilet paper, small pieces of cardboard or make or get him a few treats and wood chews to keep him occupied. There are some really awesome sites with treats and things on the net. Good luck! thank you soo much i will follow your advice im already looking for a book and i will start talking to him quietly and feed him his treats. he is only three months old and i have a starter cage will i need to get him a bigger cage or will that cage be ok for him. and do i need to take him to a vet for a regular check ups? I have a chinchilla his name is Jay every time when he goes crazy like climbs up that means he want to get out. Every time I do that he doesn't get inside the ball. Sometimes when he does I put tape on the cap because my chinchilla is smart and he finds a way to get out of the ball it takes me and hour and a half to pick him up and take him to the cage ever since he done that he whines about getting out of the cage he doesn't want to get in the ball he wants to get of his cage I can't do that because my mom wouldn't allow me. Me and my brother got him like march or january i don't know my chinchilla lets me and brother touch him a little by little he not used to us touching him or petting him. So I'm wondering how can you let your chinchilla out instead of like letting out we tried everything like we put in treats in the ball but all Jay does is he gets in and gets out. By the way Jay is getting used getting touched by little by little. Hi Lina! I'm really glad you asked this question. Actually, the balls that they run around in are VERY dangerous as chinchillas overheat very quickly in warm temperatures because their fur is so thick and dense (which is a reason they are so soft!). Please throw away that ball and never ever use it again because it is not safe at all for him. I have no idea why they are still sold at pet stores for chinchillas because they are incredibly dangerous and they are really a death trap. He probably doesn't want to get into the ball because he is miserable and gets too hot in there. Did you know that if the temperature in your home gets up to 80 degrees and above, they can overheat and die? You can read more about overheating, the dangers of those play balls that they run in, and more about their safety and care online. As far as him getting outside of the cage, I highly recommend supervised playtime in either a playpen you set up in the room (they have specific playpens for puppies or small animals), but you have to be sure the gaps aren't larger than an inch because they can squeeze through very small spaces (as I'm sure you've noticed). Some people also take their chinchillas into a small room and allow them to roam (supervised), but you must always supervise they will also chew on cords and can get into many dangerous things in there as well. I have two chinchillas and they each get an hour or so of separate playtime every evening in a playpen I got off of Amazon (https://www.amazon.com/gp/product/B0013TT2SS/ref=oh_aui_search_detailpage?ie=UTF8&psc=1). You can also buy smaller sections to make the playpen bigger if its not enough space for him, which is what I did for my girls. I put toys and cardboard boxes in there for them to have things to play with and I am always nearby so that I can make sure they are safe. This is also the time when I am able to clean their cages. Please let me know if you have any questions and I am happy to help! Well brit you should close your bedroom door have everything out of the chinchillas way and hold it and rub the chinchilla and see how it reacts to you..then if your comfortable with it put him on your bed and if he or she is calm then sit beside it and it will adjust then gently place him or her into the toy ball ...The reason why it runs away and wont let u put it in the ball..because it probably just thinks your going to put it back in its cage because you said its in there most time as you mentioned. Hi, Brittany. I have been working with Chinnys' for over 20+ years. I would reccomend against using an exercise ball for them, strongly. Because Chins have smaller legs/arms in front of Their bodies, using this ball can seriously hurt them. Also, a quality timothy hay, such as Oxbow, as well as Mazuri or Oxbow pellets is all a Chin should really have. There are herb and grain treats out there, but You might want to use those VERY sparingly. I know it is VERY TEMPTING too give them surgery treats, but they can end up with cavities, yes Chons can get them too, or worse, diabetes, etc. I have a nine year old Chin, recently adopted by Me. She is a complete joy, and one of the great loves of My life, but the ultimate begger. So, it has been very hard switching over to a quality, and much healthier food for Her. Try to give Your Chinny only filtered water, as city, or well water can make them very sick. Do not give Your Chin peanuts, or ANY sort of Human food ever. It may look, or be cute now. But, in the long run this can lead to severe health problems, and in a worse case scenario, even death. There are many good Chinchilla Web sites out there that can give You excellent info. Such as; Rondas Chinchilla supplies, TJs Chinchilla Supplies, Whimsy, and Forever Feisty Chinchilla Rescue and Chin Supplies. These sites are all wonderful, informatove, fun to order and learn A LOT from, and all of them have excellent customer service, and very easy and direct ways to order Their supplies from. Also, in answer for Your excercise question. A wonderful alternative for Chinny excercise; a Chin playpen. Or, a commonly used way to excercise Your Chinny in, a nylon, excercise, portable and collapsable dog/cat playpen. Amozon, Ebay, etc, will, and do have them. They are not exspensive, and will save Your room, and home from being a huge chew toy for Your Chinny. Remember, fresh filtered, bottled water for Your new Chin every day. This is an EXTREMELY important part to and for Your Chins over all well being and health. Goodluck, and enjoy Your new forever friend. Don't give up on Your new Chinny, it may be hard work at first, but eventually things will get much easier for both of You. Also, excersize is an intergral part of a Chins over all happiness, basic needs, a BIG, BIG NEED. Or You could use an excercise wheel in Their cage, if its big enough. Give him a little more time to adjust, sit by the cage and talk to him in soft voices. leave him in his cage and try petting him. I didn't put my chinchilla in a ball till I had him for like a month, and even then it was only for 10 minute intervals. They say balls aren't the best for chinchilla because they overheat due to al the fluff! Try ordering a playpen with a cloth bottom so he can get some exercise outside the cage. When I first got my chins, I just put my face in the open doorway of the cage a few times a day for several minutes, talking softly to them. After a few days, they came over to sniff me and investigate. When they were comfortable with that, I would reach in for a little pet. Beastie would always part his ears for me before my hand even touched him, as if telling me it was okay. He did not like getting picked up for a long time tho. I kept putting my hand in front of him every day until he did...it was many months! BeBop is the much more social chin. He climbed into my hand after only a week or so, but he dislikes​ being touched on his head, and will almost cower, trying to avoid your hand if you try, flattening his ears back and scrunching his head to the ground. He does like soft belly rubs under his chin rubs, and will go to anyone who puts their hand in front of him. He's also fearless around other animals like dogs and cats, and sometimes even has playdates with my friend Liz's bunny, Moo. Brittany, those balls they sell at pet stores are not safe for chinchillas and should never be used. I don’t even know why they continue to sell them as chinchillas overheat very easily and those balls are death traps for them. :( For playtime, I would recommend an animal playpen that you can buy on Amazon - I have one that is about 4.5 feet tall that I put out every night so each of my chinchillas can get playtime for about an hour. Also, raisins and any fruit/vegetable are not good or safe treats for chins! The best treat you can give him would be one plain Cheerio (regular, NOT honey nut Cheerios) or one plain shredded wheat (plain - not the frosted kind). His diet should be primarily fresh Timothy hay and about 2 teaspoons of pellets a day. Fresh water, a large enough wheel (look into the chin spin wheel - a safe size is 15 inches or larger so it won’t hurt his back). I also recommend a large cage like the ferret nation or critter nation cage when you are ready to upgrade. He should also always have wood in his cage to chew cause their teeth never stop growing and he can get malocclusion - which is extremely painful and something you absolutely want to avoid. He will love apple sticks and having wood shelves or a wood house in his cage. You can read more online or in books! Best of luck and congrats on your new baby! I have become primary caretaker of my daughter's 4 year old chinchilla while she's away at college. We have bonded and have great rapport. I can usually tell what he wants when he wants it. Tonight, however, was different. I just moved him from his winter room to his summer room as his winter room is too warm to be comfortable. He had two hours of free play in the room where his cage is (he has an enormous five level cage that measures 6' high x 4' wide x 3' deep and the room is 14'x18') and he normally runs around and goes back in his cage when he's ready, only coming to me if he wants a goji berry or go to another room to play. Instead, he freely came to me, but when offered a treat or to run around, he took the treat and ran around but came right back to me and started nipping at my hand, arm, trying to tell me something and I can't for the life of me figure out what. He has plenty of water and food, chew toys, and toys in general, and this is the first time in almost a year he has acted like this. I eventually put him back in his cage and he immediately went to the place in his cage where he goes when he wants to be let out. He obviously had a lot of nervous energy, as he ran a few quick times in his cage-mounted wheel. The only thing I can think of is his move to the new room, which he has played in many times, but when I took him back to his old room to play he only spent a few minutes running around before coming back to me and nipping at me again. It's clear he was trying to communicate something to me. Any ideas? He's probably just wondering where he is since you moved rooms, give him a few days to get used to the new room, he will be fine. check to see if you have put the animal closer to any wifi or energy generators - these devices have effects that humans do not feel but sensitive animals do. just a suggestion - I have no information on the realities other than my own experience of being too close to a wifi connection. I am planning to get a chinchilla and I was wondering if its okay to put them in one of those plastic balls when they roam around. Hubble's favorite thing to do is run from his cage to the book shelf using my arms as a bridge. However, he really really hates when I try to hold him. So I guess he trusts me, he's just a little grumpy? Mine is the same way. Chinchillas will climb all over you showing they trust you, but they do not like being held very often. He trusts you but just wants to run free! My chinchilla runs whenever I try to hold him. He is very tame as he will come on my back, but he will not let me pick him up. We have had our chinchilla for about a month now and we try to let him run around the house but he got inside our couch the last time we let him out. When we tried to get him out he got his tail stuck and lost some fur off of it. He was really stressed out after that. Now he won't let us pet him or get near him hardly at all. And we can't get him to come back out of his cage. I'm not sure what to do. Can anyone help us? Oh, and another thing is to limit his space so he doesn't get into trouble. The bathroom is an ideal place because it has no wiring and is fun for your chinchilla as long as you keep the toilet lid shut, so it doesn't get curios, jump in and drown. Just start over like you just got your chinchilla. When my chins aren't in their room running around,I use a playpen! They love it and I can walk away knowing they are safe and confined. Well I would recommend that you put your chinchilla in its cage and slowly put your hand in with a treat such as a raison on your palm. Next let your chinchilla take it. Once your chinchilla is comfortable with this step try putting the treat up further on your arm. When your chinchilla is comfortable with this step and your hands, that is when you can scoop them up supporting their back legs and bringing them to your chest for their support. Hope this helps! This helped me a lot. I just got 2 one year old, chinchillas, they are a bonded pair, the female is ok with me petting her and she crawls onto my lap, but the male is still learning to trust me, each days I give him cranberry traets and when he sees the bag he comes right up to me. hi, i just got a chinchilla that is 6 months and dont know how to handle him/her, my mom grabs jingle, my chinchilla and fights to get him/her, i am scard that my mom will hert jingle.i feed jingle oats and hay, i think it is good and helps my chinchilla,but i wouldnt trust me. jingle sometimes poops in his/her bath so i have to cleen it out all the time.what should i do about all these things above? Store bought chinchilla food is unsafe. Stick to hey, pellets & dried rose petals. Hi. I'm looking at getting a chinchilla for along time, but wanted to do my research first. I was at our local pet store, and the lady there told me you had to pick them up by their tails. Now i'm wondering if i should get one from them. She told me you had to pick them up by their tails only because you would break their ribs picking them up like a rabbit. Ive had rabbits in the pass, and I figure holding them was kinda the same. I was just curious if anyone had an ideal why she told me the only way to pick them up was by the tail? The lady at the pet store was most likely referring to picking the chinchilla up by the base of the tail. this is safe because they don't feel it, and it doesn't hurt them. its safer then picking them up like a rabbit. their ribs are the size of tooth picks which makes them very breakable. they also have a floating rib cage which means their ribs don't connect in the from, this heightens the breakability of their ribs. a lot of time when you pick them up like a rabbit you don't realize how breakable their ribs are. some chinchillas have died from this. I found 2 videos, they're about grooming but they also demonstrates how to hold them by their tail and where. There are a few pics of chinchillas being grooming, but they are being held by their tails. NEVER, EVER, EVER, EVER, EVER! Pick your chinchilla up by it's tail. You can't hold them like a rabbit either. You can't hold them like a rabbit because they do have floating rib cages and you will break their ribs. You can't hold them by their tails for the same reason. It will seperate their spine and kill them. You can pick them up by just scooping them and make sure you're supporting their feet. Chinchillas like to be held in all differnt postions and yours will let you know what one is comfty for them. They will also let you know if you are hurting them. And for as far as them not being able to feel their tail that is a complete lie. We have a chinchilla who is the sweetest little guy in the world. He lets my little sister wrap him in a blanket and carry hime around the house like a baby. If you touch his tail though he'll instantly bite you. This obviously means he can feel it. Also any chinchilla we've ever had (we run a rescue so alot go through us) reacts if you touch their tail. I'm sure your chinchilla would too, this means they can feel their tail. as you can see it is no debate, it is considered safe. We just got ours today and that was the first thing they told us was NOT to EVER pick it up by the tail or even pull or hold onto the tail. Ours was so friendly at the pet store and just let us hold it but then when we bought it and they put it in a box and we took it home I think It got scared. So were just giving it some space so he can get used to his new home. Makes this noise a lot too and sneezes too. My Son is so excited and just wants to hold it but I don't think he is ready yet! have to chase him around his cage when i try to take him out, or i have to chase him around the room when i try to put him back in his cage. motivated by any type of treats. Please help! Hey, i'm Ceara. I have two chinchillas, and i always let them out. THEY WILL GET BETTER. Trust me, it takes away for them, but they will learn to trust you, i say look around for different treats, they probably didn't get much treats at the pet store, so leave it in their cage and let them smell it. Goodluck! With a new chinchilla, you are gonna want to keep it in its cage for the first couple weeks, feeding it treats through the cage bars, so he can get accustomed to his surroundings. Eventually, you can let it out and explore, and will expect treats only from the cage. Naturally, he will go back in his cage, so chasing is not required. Chasing it around will also frighten it, and possibly traumatize it. Best thing is to just be patient, as taming it will take time. Good luck, and have fun with your new chin! I have done alot of research over the past month and convinced my mom to think about getting me a chinchilla for my birthday. the only problem is that i have an 8 year old little sister who loves to hold small dogs and cats at other peoples houses and dose not listen when people say to put them down. im afraid she will harass my new chinchilla and possibly take him out of the cage when im not around. any advice? I have had a male chinchilla, Edgar, for more than a year. He likes to be scratched behind his ears and under his chin. He doesn't like to be held. He harrasses the cat and the dogs. Our mastiff/hound puts up with it because she came to us as a puppy and Edgar was already part of the family, but the cat and dog that we already had when he joined us would rather be put outside if we let Edgar out to run around. It seems that he like to play hide and seek and chase. If I play hide and seek with him for a while , when I finally have him corned to catch him, he will jump into my hands. We got a plastic wheel for him recently but he hasn't figured it out and mostly used it to leave droppings. Actually...picking a chinchilla up by the tail is completely fine. My family used to breed chinchillas. When our herd was at it's biggest, we had around 1000 (yes, One THOUSAND) chinchillas. We were part of the National Chinchilla Breeders association, and were in the business for over 15 years. Picking them up by the tail is how you are SUPPOSED to pick them up. It does not harm them in any way, shape or form. Their tails are extremely resilient and tough. Picking a chinchilla up by the tail will NOT lead to harm, and it will NOT agitate them. As a side note, chinchillas LOVE dandelions. Even more so than raisins (which was a very close second as a treat). When I was a girl my dad would send me out to pick all the dandelions in the yard, and freeze them for the chinchillas as a treat. 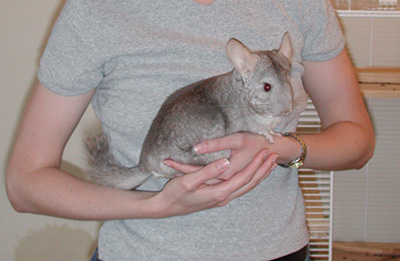 Picking them up by the tail may be fine if you are mass breeding them or if there is an emergency and you have to pick your chinchilla up quickly but they are saying to not pick your chinchilla up by its tail more for the purpose of bonding with it. They don't enjoy being picked up by their tails because then they are not in control and feel very stressed and exposed. So, in regards to bonding with your new chinchilla and allowing you to pick it up, i would absolutely never recommend picking it up by its tail. Hi. I have a chinchilla named Rosie. I've had her for about 2 years now and she seems afraid of us still. I can scratch her sometimes but cannot pick her up without chasing her around the cage and if I hold her I have to hold her agaist my chest or she'll jump. If she gets out she runs under the couch and she cries and won't come out. Any suggestions? I want her to be able to run around and play with us and sit with us and be able to pet her and stuff. I don't know what to do. I keep a schedule with her and that doesn't seem to help either. If she does get out, she won't come near me for days! I was told too by my breeder that i can pick my chinchillas up by thier tails. i do and thier fine. I have three of them. Maisy who is 6 months old, buttons who is 2 yrs. and lasdy gwen who is 4 months . and thier fine . now i don't grb them by the tail ad let them dangle there. i grab them by the tail and bring them close to my body and hold them that way. now maisy my 6 onth old i can grip her tail and them have her lay on my shoulder. but buttons and lady gwen won't do that i ahve to hold them by the tail sn pet them. thier skittish for some reason but they still let me pet and ho,d them. lady gwen has jsut started warming up to me. buttons gets in a MOOd where she willl let me hold her but them i have chase her araound the cage . i've got two chinchilla's,ant and dec. i got them of my dads friend who breeds them,they are brothers. ive had them for about 3 weeks now and would like to handle them but how could i do it fairly,i dont want to leave one of them out (n). ive got pictures of them on my bebo if you's would like to look at them. they will eat out of my hand and sometimes let me pet them. Hi, I have a question. I'm very confused with my female chinchilla Phoenix. We adopted her from a girl about 2 or 3 months ago and she is really happy and everything. She never used to chew on things and now she loves all the toys that we got her so I know that she is very content with us but she tends to spray me with urine at least every day or every other day but she is usually in a good mood. She just sprays me then acts like she wants to play or something. It's really wierd but i definitely know when she is upset or ornery and that's usually in the morning and I completely understand that but when she does it out of the blue with no warning, it makes me think that she is trying to play and it having fun. I had a chinchilla called QiuQiu, and he loved it when I patted him! he always came jumping to me to let me stroke him. Celsea when I got my chinchilla roxy she also didn't come to me and ran away and things like that but if you try to play with her every she starts getting to know you better and won't be like that and she now looks to play with my it took me like a month for her to be good with me but it was totally worth the wait she loves me she jumps on my shoulder and sometimes even on my back she is lovely and my whole family plays with her but she's not so good with them as she is with me all what you need is time but after that they are really good. is it true that its extremely easy to break their ribs? My chinchilla, Ishmael, can't be held, mainly because the people who I bought him from would pick him up the wrong way. I can pet him with both hands and he jumps up onto my lap, but if I try to hold him he dashes away. I don't want to hurt him, and I never need to pick him up. Is there a way to hold him though? I try a few times every day, slowly and carefully, but nothing works. Jose' maybe you should try getting Ishmael to come to you. Start by gently rubbing in between his ears than hold out a raisin, pellet, or a favorite snack of Ishmael's. Then if he approaches your hand pick him up correctly then reward him with the treat. After doing this for a feww days Ishmael will start trusting you and you'll be able to do this without the treat. Only try this once a day if you continue to use a treat, you don't want to overfeed him because he may get sick. i heard that if you pick up your chinchilla from the body, it can break its ribs because they are so fragile. is this true? DONT EVER PICK UP YOUR CHINCHILLA BY ITS TAIL!!! You can hurt your chinchilla or even accidentally pull off the end of its tail (it's not like a lizard - it doesn't grow back!). Pick up your chinchilla gently by slipping your hands under it and lifting it close to your body. Be sure to keep its legs supported so that it feels comfortable. If it struggles, use your hands and arms to cradle it close to you, but be sure that you don't squish or grab it in any way that hurts it. I have found that it's a good strategy to distract the chinchilla (and reward it) by giving it a raisin or a nut while you're lifting it or just after you've picked it up - mine will usually hold still for a few seconds while she is enjoying the treat. Above all, be gentle and try to be as soothing as possible with your movements and voice while you are attempting to handle your chinchilla - they will remember the experience and it will either make it easier or harder next time! I had the same problem with my female for a long time. I actually carried her cage into my bathroom (my chin-proof room) and just opened the door to let her get out on her own for a long time after I got her. After a while though I would lure her into her dust bath canister and then bring the canister with her inside into the bathtub and close the shower doors. Then I would sit down cross-legged in the middle of the tub with my back against the opposite wall (so the chinchilla couldn't get behind me or out of my reach) and just let her run around in the tub. This way she was forced to be in close proximity with me but was also allowed to run around freely. I moved my hands and arms very slowly during these sessions so that I wouldn't startle her and I would occasionally pet her head or back, or try to scratch her gently under the chinchilla (she LOVES this and will usually close her eyes half way and her ears will droop). :) My chinchilla was neglected for the first 2 years of her life before I got her so I don't think she will ever really like to be handled, but she doesn't spray me with urine anymore and she's actually sitting on my shoulder right now as I'm writing this (although I didn't pick her up to get her there). Try the bathtub thing for a few weeks, every night or every other night, and be sure to bring a couple bits of a torn raisin or some peanut halves to help make it a positive experience. Especially reward her when you first bring her out as this transition is the most stressful part for her, as well as when you return her to her cage. And talk to her in low, quiet soothing tones during the whole process so that she begins to trust your voice. Hi, im 13 and im getting two chinchillas. There both males and i've done all my research but this might sound dumb but will chinchillas get scared if an alarm clock goes off at 7;00 in the morning for school? 13 might sound young for a person to get a chinchilla but i've been doing my research for 2 months now and im pretty sure im ready. so please help me with my question! A.K.A, will chinchillas like get too stressed out if my alarm clock goes off ? my chinchilla has a lumpy bit in her fur don't know what to do you know what to do? also one side of my chinchillas face there is only two whiskers and little stubby bits where the whiskers were before i don't know why thy are all going my dad said she may of bit them off do you know what may have hapend to them or is this normal? before i had her she was with my aunt for a month and she did not want her so gave her to me and before that a lady had her and my chinchilla does not trust me i don't know whether this is because of the owners she had before. i am really calm with her and she runs round my room for an hour a day and i give her treats when she goes back and place them in my hands. She barks at me when ever i put my hand in her cage or try and get her out i cannot seem to be able to gane her trust and i realy love her and want her to like me. Aloha from Hawaii. My wife wanted a chinchilla so I got her one from the Local Pet shop. It's a male. She tried to tame him but she would be afraid when he tried to nibble on her fingers. Anyways I would spend some time in front of his cage, everyday at the same time and let him come to me. When he did that he was rewarded with a treat. After a week he got pretty comfortable with me and I can pet him, if I open his cage door and just sit there he would hop out and sit on my lap, or climb up on my shoulders. After a month or so we got another male. Pet store says it was ok to house them both in the same cage. tired it the first night and they seemed ok at first then it looked like they were fighting. Well the next day I went back and bought a second cage. I placed the cages side by side for a week and would place them together in a cage for 10 minutes at a time. It has now been a few weeks and the seem to get along better. Next step I cleaned out the larger of the two cages put all new bedding to remove any smell of any chin. Then I placed them back together into a fresh cage so neither would feel dominate for the other. This slow patient process seems to have made the transition of having a single chinchilla to having two in the same cage. As long as you're not chasing your chinchilla or trying to pick her up against her will, there's not much else you need to worry about. Being in the same room and letting her approach you should work well. Keep the raisin in your hand as a reward for when your chinchilla comes really close to you. Even though they're small, raisins can still be cut in half and used as treats. We found that being consistent in terms of time of day for visits helped. Especially when it came time to get our chinchillas back into the cage -- they pretty much went back in at the same time every night with little prompting from us. Great guide! We recently purchased a chinchilla and I want to be sure I'm following the correct steps. It was from a pet store and our chinchilla did bark when get got home and put it in its new cage. We brought the largest cage we could (second I guess, largest was this ferret cage I thought I could sleep in), tons of toys...the works. I'm convinced over time our chinchilla will find its new home much more comfortable than the pet store. We put the cage in the quietest part of the house, and my question is: How long should I wait to try interacting with her? I don't want to startle her in any way. What's the normal schedule for interacting with your chin? Should I sit by her cage an hour every day at the same time for three weeks? Am I allowed to give her a raisin? How many times in a week? Wikipedia says only twice a week at most, so should I only try interacting with her twice a week at most? In your opinion, what's the best way of approaching this without causing any extra stress for her due to the new move. So I'm a new chinchilla owner, and for the first week or so he was calm and looked like he was happy. But then recently, he's been biting on his cage, biting my fingers, and running away when I hold him. Is this normal behavior for a chin? I got my two chinchillas yesterday and was quite lucky. Mowgli (1 year old male) is not very tame yet but that could be expected. But Lucy (3 month old female) is already all over me. Their cage is big enough for me to sit in and she jumps all over me nibbling on my clothes and climbing on my shoulders. I really hope Mowgli will also become that tame. Same with my chin, she gets to scared and when i try to hold her ,she trys to get out of my hands. I get scared when she does that because i think she will fall and hart her self. I'm pretty much new on this site thingy. I was reading what you were saying, Stephanie, and I want to try and help you out. I myself, am having this problem too. I've had Leo(my chin), for 2 months now. And he is STILL not trusting me yet. But, he is getting better. Chinchillas, as I'm sure you already know, are timid creatures. They are always on alert, due to them being prey in the wild life. So, it comes natural to them. What you'll need to do, is gain its trust. Start by talking to it in a calm soothing voice. Not too loud. Also, to gain its trust, you should grab a chair, and sit next to the cage quietly. Read a book, or something that doesn't make noise. Sit there for a while....and do this everyday, at the same time. And eventually, your chinchilla will walk up to the end of the cage where you are sitting, due to curiosity. Whenever he does come to the the side, give him a treat. Now, he will flinch most likely, if he is afraid, but he will return. Once he does, poke your fingers in, in front of him with the treat. He;ll sniff it, and then grad and eat it. I would do that for sometime. Chinchillas take quite a while for them to fully trust you. And even when they do, they STILL are a bit skitish on us. After he gets used to this pattern...start a new thing. Such as, opening the cage, and feeding him a treat like that. He'll get used to you. Another good way to gain its trust, is when you can touch him, such as stroking his head softly, start to scratch his neck. They LOVE this. Just like a cat lol. But hey, I'm sure you can do it. If you want more advise on how to taming your chin, just google the info. I've received quite a lot from google. The one thing we'd warn you against is picking up your chinchilla in a way that scares him. Doing so will pretty much guarantee that he'll never trust you and will be inclined to run away from you. My dad finally brought me my chinchilla! He had to stay at my dad's over night (my parents have breaken up) and he brought it to me the next day. In a car. He's very calm and every time I take a peak at him in his cage, he's sitting in the same spot. I'm guessing that he's sleeping since I don't have a house-thingy in the cage. I just placed in a jar. I wonder if that's okay? The breeder told my dad that you grab your chinchilla by the tail and then push it towards you with the other hand. And I'm talking about grabbing not pulling or lifting by the tail. I usually have to do that when I let him out and he tries to get under my bed. The first time he was there I crawled after him but he made this noise. I guess it's the "bark". He's still afraid of me D: Though he's calm when I pick him up or place him in my lap. I guess he just doesn't like to be followed. Wow... That was quite a rant ^^; Sorry about that. I just needed to discuss this with other chin-owners that could give some advice. I have had my chinchilla for about 3 years now and I still cant pick it up! This has become a very stressful thing for me. Everytime i pick it up it moves a lot and leaves fur so i let it go. Any advise? Please help me! Also I noticed that when the guy at the pet store got the chinchilla out of the cage for me when i bought it He grabed it by the tail! Please help me im desperate! To get your chinchilla to let you hold her again is but her in the cage take her out hold for as long as she will let you if she get lose let her go then lay with a treat in your hand and let her come to you to get the treat but do not try to pick her up just try to touch her head do this a few times then she will start trusting you then try to pick her up and when you pick her up give her another treat after a few days of this you chinchilla will be friendly again. Picking a chinchilla up by the tail can cause them harm and we don't recommend it. We're not familiar with the re-taming process. Could you described what it entails? Check out our article on chinchilla leashes. Hey i just got a chinchilla and its very lovable and i love it. I wanted to know if you can buy it a leash or a harness of some sort? And will it stay in the harness or leash? I've had a chinchilla for about a year and it is tame but never likes to be caught. He will let me pet him though. For those of you who can't catch your chinchillas it's OK as most chinchillas would rather be on their own feet. Our chinchillas have learned to go in to their cage without much prompting. We accomplished this by returning them to their cage at about the same time every night. We also generally feed them their treat (a raisin for example) while they are in their cage at the end of the evening. Again, they eventually picked up on the routine and now need next to no prompting to go in to their cage. As for playful chasing, that depends on how your chinchilla reacts. If you chase your chinchilla, then stop chasing, and she comes back to you, then that's a good indication that she's not scared. However, if you chase your chinchilla and she doesn't come to you after you stop, then that likely means she doesn't consider the activity playful. Our chinchilla is pretty comfortable with running around the living room area and kitchen area. When we try to pick her up to go back in her cage she runs away. We want to know how to get her in her cage when we want her to. And is it okay to playfully chase the chinchilla around the living room? You'll need to chinchilla-proof a room as soon as you can. Those plastic balls are pretty much junk (we bought one too when we first got a chinchilla) and can actually hurt your chinchilla because they are prone to overheating in them. A collar and leash are also generally considered to be dangerous. Although having your chinchilla run outside the cage everyday isn't mandatory, it can make for a happier and healthier chinchilla. I just got a chinchilla last night and I read in this handbook thing that you have to let the chinchillas get exercise 2 hours a day, but for one thing, I don't have enough time for that, and we don't have any chinchilla-proof rooms. I tried putting him in the little rolling ball but he just sits in it and if I let him walk around, he'll get in hard-to-reach places. I tried getting him a collar and leash but he can get out of it. What do I do? Please help! Never put your chinchilla in a ball! These are very dangerous and they can cause fatal heat exoustion. It’s also hard for them to breath. Don’t ever use leashes or collars. Collars can break their neck and they can choke. The harnesses are also very dangerous. Chinchillas have very fragile bones and can break easily. Harnesses can break their rib cage. One tip is that you should not get a chinchilla if your not educated and don’t have time for a pet. Chinchillas are a 15 to 20 year commitment. Hopefully this helped you. If you have any questions about chinchillas I’m happy to help you. I'm planning on getting a chinchilla and i wish to be able to pick it up but I don't know how to gain it's trust to pick it up. How do I gain it's trust? Is it true that chinchillas aren't nice and cuddly pets. Because I went to the petstore that I am going to buy the chinchilla from and I held one. It was squirming but as soon as I snuggled with it, it closed its eyes and rubbed up against me! You can't make a chinchilla trust you. It will happen over time. You need to be patient. Sit with them often, move slowly, don't make loud noises, and use treats (in small quantities) such as raisins to encourage them to eat from your hand and come up to you. Hello. I was thinking about getting a chinchilla and I was wondering how do you make a chinchilla trust you? Not all chinchillas will allow you to pick them up no matter how patient you are. They are not lap animals and will NEVER sit as still as a cat or dog. However, some people have had luck with picking up their chinchillas. We can easily pick up one that we have, but the other squirms a lot even after 5+ years. Hello, I got a chinchilla about a week and a half ago. I was really excited, but my chinchilla will not let me pick it up! I don't know if it just hasn't adapted to his new environment. I want an animal I can hold and play with. Is a chinchilla right for me?